SF Marathon weekend is almost here! I'm equally excited for the weekend events and the race itself. I'll be running the 1st Half Marathon for the third time; this event runs over the Golden Gate Bridge and was my very first half marathon ever back in 2009. My original 2014 goal was to run the marathon, but the hip flexor injury lasted longer than I hoped so I decided to back off on distance for this event. If you are running the race or hanging out in SF, you should check out the fun events on Saturday. The expo at Fort Mason is open to the public and there will be a social media meet up on Saturday at 1 pm. Meet your Twitter friends in real life, just like I met Alisyn at the meet up in 2012! There is also a shakeout run with Bart Yasso starting at 8:30 am on Saturday. I can't wait to finally meet him. Friday, I'll be hanging out with other SFM Ambassadors at Thirsty Bear Brewing for a brewery tour, dinner, and beer. 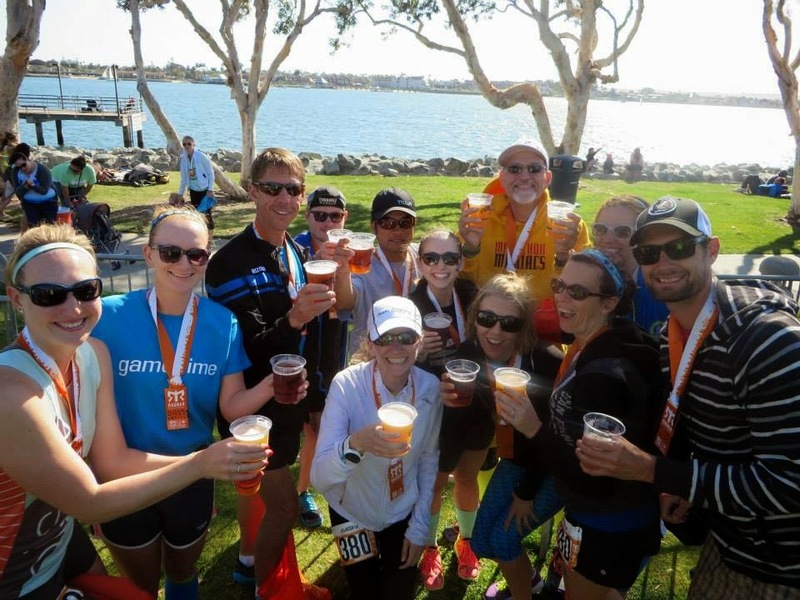 If you read this blog, then you know dinner, beer, and running friends pretty much equals my perfect evening. We owe a huge thank you to Wes for setting up this dinner. Can't wait to reunite with many of these beer drinking friends! Last but not least, I'm ready rock the hills of the half! I'm going for a course PR. I've been hill training lately and feeling stronger, so I'm confident I have it in me. Hill training is a big bonus of trail running. If you are running or have friends running the race, don't forget to check out the new race day app designed for SFM by Pebble. It's available for both Android and iOS and offers runner tracking, event schedules, and race course maps. Good luck on the PR and have fun! Sad to miss it this year - have an amazing time. Sad I missed you, but I hope you had a great time! super stoked to see you!! Wait! I ran the SF 1st Half Marathon this weekend! I was visiting family so didn't get to do a lot of the fun events over the weekend. It was my first time running it and definitely an experience! Awesome! I love this race so much, I hope you enjoyed it too!